I never really drank coffee until about a year ago. I always swore I would never develop the habit. And here I am now, coffee cup in hand as I start my day. It’s not so much about needing the caffeine (although it certainly helps some days). It’s more of a comforting and social experience for me. I love gathering with friends and colleagues at Valley Fire Espresso, a local coffee shop. It’s about connection and brainstorming and catching up and indulging. The homemade goodies they serve help with the indulging part too. The environment and the company are what I crave. Not necessarily the caffeine. When I drink coffee at home on the weekend, it’s for the comforting feeling of wrapping my hands around a warm mug as I begin my day of cleaning or cooking or farm wifing or moming or traveling or whatever the weekend has in store. I also drink coffee so I can use fun mugs. They pep me up and make me smile. And I like pepping other people up and making people smile so I like to give fun mugs as gifts too. I can drink a cup of black coffee, especially if it’s Normal Roasting Company coffee. You can tell by their unique flavors that they put a whole lotta heart and soul into roasting their coffee. I’m also the coffee drinker that doesn’t mind some extra love in her cup of joe. Flavors, creamers, whipped cream, sprinkles, rainbows and unicorns. Just kidding about those last too. My point is, I don’t discriminate when it comes to coffee add-ins. As much as I love all of the flavored creamers you can conveniently buy in the store, I don’t love all of their ingredients. You know…the pre-packaged, shelf-life-extending ingredients. Bleh. 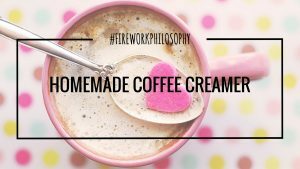 That’s why I decided to experiment with homemade coffee creamer. And there’s been a bonus in doing so! I finally found a use for my never-been-used stainless steel cocktail shaker which was a wedding gift that has made it’s home on the very top shelf in the cupboard. But I couldn’t bear to throw it away. I must have sensed it would come in hand some day. 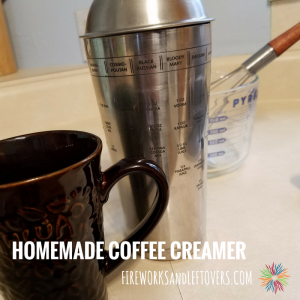 The shaker is perfect for making homemade coffee creamer because it’s got shake-able, pour-able and store-able features. Once I shake up the delicious concoction, I simply store the shaker in the fridge and pour into my coffee cup as needed. This three-ingredient homemade coffee creamer is a breeze to make and if you don’t have a cocktail shaker, you can easily shake it up in a mason jar. You can make all sorts of variations too. Add different extracts, like peppermint if you’re feeling festive, or a few tablespoons of ice cream topping, like caramel or chocolate if you’re feeling indulgent. What’s your favorite coffee creamer flavor? Or are you a purist when it comes to your coffee? Add all ingredients to a cocktail shaker or mason jar with a lid and shake until combined. Add your desired amount to a cup of coffee and enjoy. Store in the fridge and shake well before each use. TIP: Replace the vanilla extract with other flavors like almond or peppermint. TIP: Add a few tablespoons of caramel or chocolate ice cream topping for extra indulgence and flavor. Warm the ice cream topping slightly before adding to the milk mixture to ensure it incorporates well. TIP: If you don't use coffee creamer all that often, cut the recipe in half and freeze the other half of the can of sweetened condensed milk for next time. 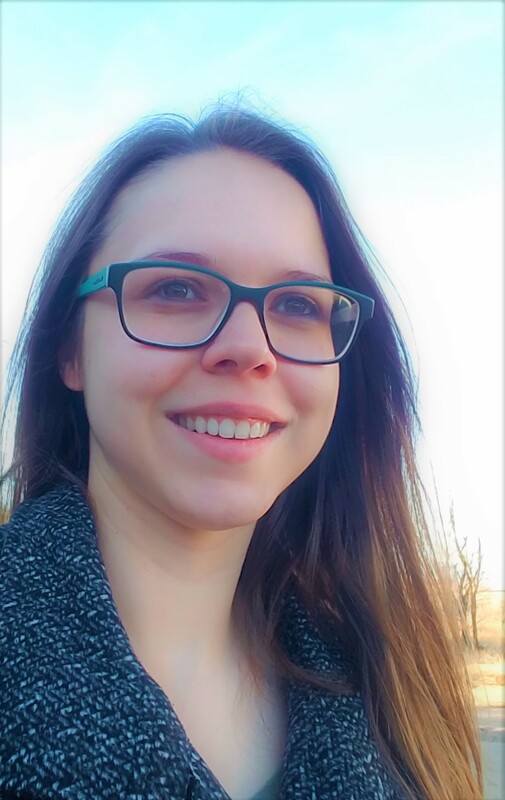 Kristina It’s a pleasure to be following you! This sounds delicious, and so easy to make! 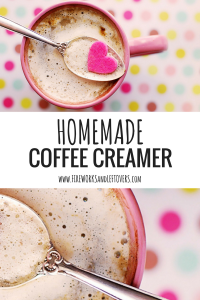 I don’t like the taste of half and half so I never put it in my coffee and store-bought flavored creamers are over the top, but this seems like the perfect way to add some milk and some flavor without going overboard. You’re spot on, Kate! Add as little or as much as you like!